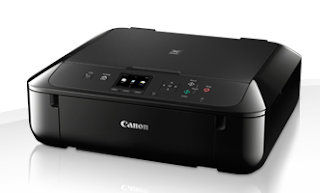 Hassle-free printing and scanning with smart devices and cloud. Have fun creating beautiful images and documents with this versatile, user-friendly, 5-ink All-In-One. Easily connect, print, copy and scan at home using these affordable Wi-Fi All-In-One. Photos will be packed with a high level of detail, deeper blacks and more vivid red - thanks to single ink 5, the Canon FINE technology and a print resolution of 4,800dpi. ISO ESAT speeds of 12.6 ipm in mono and 9.0 ipm color give 10 x15 cm beautiful borderless prints in approximately 41 seconds.